SAN ANTONIO – Although it’s best known for a Spanish mission downtown that looks like a facsimile, the Alamo City has also earned a reputation the past four decades as a hard rock hotbed – the Detroit of the Southwest. The words “Hello, San Antonio!” have launched a thousand nights of musical mayhem. And yet, aside from a brief blip on the nu-metal radar by Union Underground in 2000, this culturally rich city of about 1.3 million has not given birth to a national breakout rock act since the Sir Douglas Quintet had a hit with “She’s About a Mover” in 1965. The best bet to put San Antonio back on the charts could be a trio of young, tattooed Latinas who deliver their hybrid of propulsive punk rhythms and edgy pop melodies with refreshing enthusiasm. 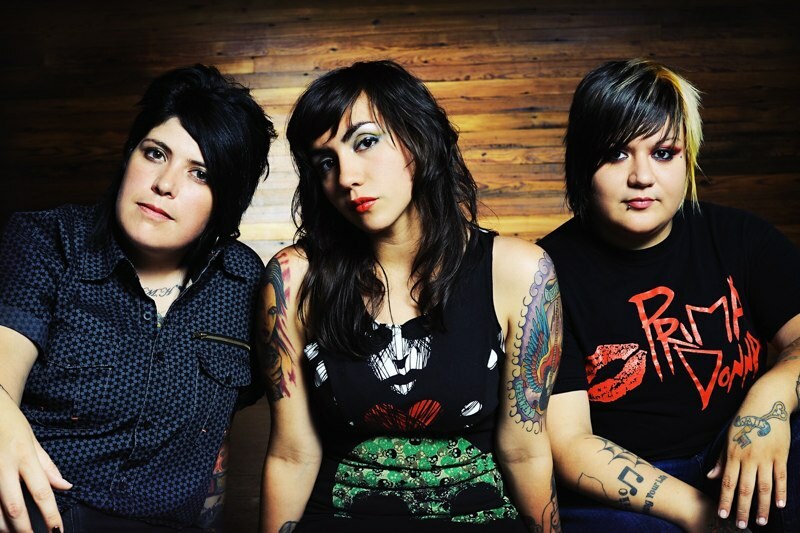 Girl In a Coma formed in San Antonio nine years ago, when lead singer Nina Diaz was only 12, but they’ve slowly, organically built a following that could explode with new fans after Tuesday’s release of “Trio B.C.” on Joan Jett’s Blackheart Records. Dave Navarro of Jane’s Addiction is not alone when he touts the trio, which is rounded out by bassist Jenn Alva and Nina’s older sister Stephanie “Phanie” Diaz on drums, as his favorite new band. The inventive “Trio B.C.” is the sound of dreams, dues fully paid, about to come true. “Girl In a Coma has the look, the attitude, the cross section of fans, and they’re brilliant live,” said Paul Saucido , the former ME TV host who covers Latin rock in his Saucido Slant blog. 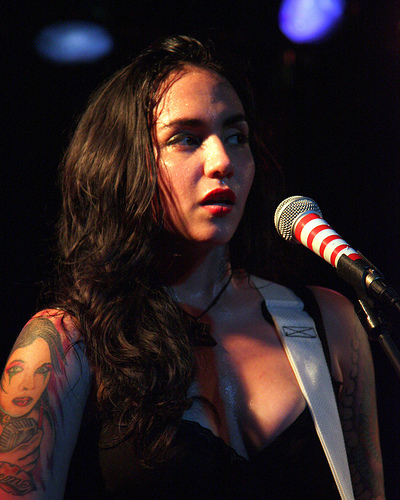 “That and the fact that Nina is an amazing front person are good reasons why they’re building a name nationally.” The band got a big break in 2007 when Morrissey, who wrote the trio’s namesake tune, “Girlfriend In a Coma,” while a member of the Smiths, offered GIAC an opening slot on his tour, eventually taking the awestruck trio to Europe. What has made things difficult in recent months are felony charges hanging over Nina Diaz and Alva after a March 22 scuffle involving police officers working as security guards at Chances, a lesbian bar in Houston’s Montrose district. According to a complaint filed with the Harris County district attorney’s office, Nina Diaz is charged with assault on a public servant, accused of striking an officer while being detained. The police report charges Alva with causing bodily harm by throwing a glass bottle at a second officer. Diaz and Alva were released on bail. Kent Schaffer, a lawyer for the two musicians, denied they were at fault and said he’s interviewed several eyewitnesses who dispute the police report. Shy, tiny Nina Diaz practically hid behind the neck of her guitar during a recent interview on the enclosed front porch of the Northwest San Antonio home that the three women share with the Diaz sisters’ mother, Maria Gonzales, and her husband. While Jenn and Phanie did most of the talking, Nina tapped the top of her guitar against her forehead. Offstage, it’s hard to believe this is the wild-eyed 21-year-old who becomes possessed by the music. There’s no debate that frontwoman Diaz, whose lyrics are often inspired by literary heroes Oscar Wilde and Sylvia Plath and delivered with aplomb, is the star of the group. But the indispensable rhythm section of rock ‘n’ roll lifers Alva, 29, and Phanie Diaz gives the band much of its boisterous charm. “We’re all about the dynamics,” said Alva, describing the way the band’s material often shifts from ethereal into punk overdrive. But she also could have been talking about the band’s persona. Girl In a Coma doesn’t look like any band you’ve seen before. And they don’t sound like anyone else, either. They’re San Antonio kids, hard-rocking Tejanas who were equally devastated by the deaths of Kurt Cobain in 1994 and Selena a year later . “Our family and our culture and our heritage are very much a part of us,” said Phanie Diaz, who has a map of her hometown tattooed on her arm. Girl In a Coma grew out of Phanie and Jenn’s former punk band, Day Old Rice. The pair met as 12-year-olds at Longfellow Middle School, when they discovered a shared love of Nirvana and Smashing Pumpkins. After DOR broke up, Jenn and Phanie decided to start a new band. “We wanted it to be like a family, so we only auditioned our friends,” Alva said. They were stunned when Phanie’s demure sister Nina asked if she could try out for singer. The younger Diaz played a song she had written, and the two older members were blown away. “Not only could she sing, she already knew how to write hooks,” said Phanie, who was going to be the band’s guitarist but switched to drums to make room for her sister. Although Phanie’s father is noted conjunto drummer David Garza, she hardly knew him and taught herself to play. Nina’s father was a mortician who hasn’t been in her life since she was 4. In the early years of the band, Nina Diaz stared straight into the microphone when she sang, not wanting to make eye contact. Still, she found her calling. “I knew, right away , that this is what I wanted to do,” Nina said. She dropped out of high school as a junior in January 2005 when Girl In a Coma had an offer to go to London for a few weeks to record a demo with Morrissey’s guitarist Boz Boorer and play a few shows. It was the first time the three had been on an airplane. The women of Girl In a Coma have already gone further than their minds had projected when they started bashing away in 2000. And as for following their hearts, they’re right on course. This entry was posted on January 31, 2012 at 9:31 pm	and is filed under Music. You can follow any responses to this entry through the RSS 2.0 feed. You can leave a response, or trackback from your own site.